Why not give this midweek meal a try? This recipe is quick, easy and jam packed full of flavour. The perfect dinner for when you’re short on time and looking for something healthy. This recipe will easily feed 2 people (with maybe a little left over), all you need is a wok. Firstly melt the coconut oil in the wok then add the garlic, ginger and chilli and fry for 2 mins being careful not to burn the garlic. Add the onion, pepper, mushrooms and courgette and fry until the vegetables start to soften. Add the chorizo and fry gently for 3–4 minutes until crisp. 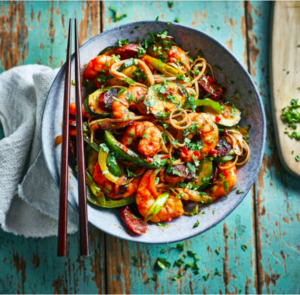 Throw the prawns and spring onions into the wok, stir-fry for a minute then add the noodles and sweet chilli sauce. Cook for a further 2 mins. Tip everything into 2 bowls, scatter over the coriander and serve. Enjoy this one and keep an eye out for more recipe ideas coming soon.